The internet is a big place, with a lot of content. Over one billion websites at the time of writing. With the web constantly changing, it’s hard to keep track of which sites have the best content and resources. 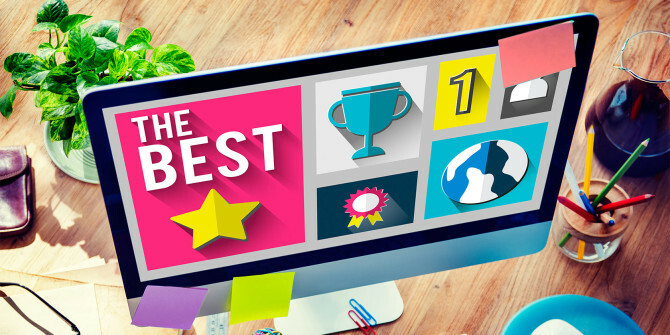 The websites on this list are those that we consider to be the best: genuinely useful, top-of-the-line sites (not apps) where you’ll find what you need. We update this list regularly, so check back occasionally, and be sure to tell your friends! Currently around a third of all internet packets sent are Netflix packets. And for just $9.99 a month, you can add to that number. With an astonishing number of movies, TV shows, and documentaries available to watch on demand, Netflix is a worthwhile investment. Plus, their original series’, including House of Cards, Arrested Development, and Orange is The New Black, are all worth catching. TV streaming service Hulu isn’t appreciated as much as it should be. If you subscribe to the $7.99 per month package, you’ll have access to a quality library that’s also supported by commercials. If you want commercial-free access, it’ll cost $11.99. For that, you’ll have access to TV series like Homeland, original programming like Casual, and blockbusters like Terminator Genisys. Amazon’s video streaming service isn’t as elegant as Netflix’s, but if you have Amazon Prime, it comes as part of your package. They have an absolute ton of great stuff in their catalog including many critically acclaimed original shows. Amazon’s deep pockets are also seeing the company signing exclusivity deals with companies like HBO and the BBC, meaning their library of shows is just getting better and better. Movie tickets are expensive. Want to know if a movie is good before you watch it? Rotten Tomatoes has your back. Rotten Tomatoes aggregate reviews, categorizes them as positive or negative, and then averages them. The result is a simple, unbiased appraisal of the odds that you’ll like the movie. The results aren’t always perfect (they gave heretically low scores to The Prestige and O Brother Where Art Thou), but they are the best out there. Literally one of the oldest websites on the internet (it predates the web browser), IMDb is one of those exhaustive, meticulous collections of movie ratings, facts, and trivia that would take decades to replicate. You probably know YouTube as “that place you can watch people in Saudi Arabia do terrifying thingswith cars”. But YouTube is so much more. In fact, it probably belongs in nearly every category on this list. One of the best (and less known) features is the ability to rent movies starting at $3.99 each. YouTube has almost everything. And, thanks to its compatibility with Chromecast, has become a regular part of my movie-watching life. If it’s not on Netflix, it’s probably on YouTube. As a self-respecting movie buff, ScreenRant should be one of the sites you visit religiously. Packed with the latest movie and TV news, this is an insightful, well-edited publication that will keep you in the know for anything Hollywood related. Plus, during dry periods of movie news, you’ll be treated to a constant stream of opinionated editorials. Each week, a new, independent, hand-picked short movie is added to Short of The Week for you to watch for free. These can be on any topic under the sun, from love, to killer zombies. Each of these shorts are special. Every short manages to incorporate incredible storytelling finesse into 5-20 minute movies. It’s a fantastic way to while a few minutes each week. Many people see Vimeo as little more than YouTube’s smaller competitor. But the site has managed to capture a segment of the movie industry that’s hard to find anywhere else. Home to a vast number of indie filmmakers, Vimeo is the place to find refreshing, art-house movies to stream on demand. We’re talking about the kind of films you’ll see played at festivals like Tribeca, Sundance, or SXSW. Spotify has seen its fair share of controversy (including a high-profile tiff with Taylor Swift). However, it remains the best service, on PC or mobile, for streaming any music, whenever you want. The free service is a good introduction, but it’s worth picking up Spotify Premium. You don’t realize how annoying the ads are until they’re gone. Plus, the offline access is a god-send.Why Taylor Swift Is Wrong About Spotify Why Taylor Swift Is Wrong About Spotify In the past week Taylor Swift has pulled her music from Spotify, inspired countless song-pun laden headlines and reignited the debate about streaming music services. Without a doubt, SoundCloud is God’s gift to indie music. It’s a simple, bare-bones service that allows anyone to upload and download music under a variety of licenses, and embed uploaded tracks across the web. It’s effortless and has a novel timed annotation feature, allowing people to discuss music in an entirely new way. SoundCloud is great, and if you want to hear the next big thing before the labels do, SoundCloud is where to look. Connect your SongKick account to your Spotify, Facebook, and Last.fm accounts, and you’ll be kept up to date about when your favorite artists will be playing nearby. You’ll also be shown the ticket prices from various merchants so you can quickly find the cheapest option. This is a simple, yet powerful way to ensure you never miss another live gig. Streaming music is great, but sometimes you want to buy tracks you can listen to offline. iTunes, since the release of the first iPod, has grown to dominate the music industry, comprising more than 60% of all music sales on Earth. If you want to buy music (or movies, or audiobooks), iTunes probably has what you’re looking for. It’s also heavily intertwined with Apple Music, Apple’s direct competitor with Spotify. Although it has a smaller library, for a similar monthly fee ($9.99), you have unlimited access to the entire library, ad-free. Last.fm eavesdrops in on your listening habits, and uses statistical analysis to predict what you might like. By installing Last.fm’s “toggler” onto, say, your Spotify account, the service offers accurate recommendations for other artist’s you’re likely to enjoy. Pandora (US users only), is a great tool for finding new music. It’s a “free personalized internet radio”. Simply add a few of your favorite artists and the station will start playing related music that you’ve probably never heard before. Pandora is a great tool, and hopefully it’ll stay that way for years to come. Genius is a huge community of music lovers. This is where people turn to when they want to discuss and deconstruct a song, or a specific lyric. It’s where artists come to explain their music to the world. Home to hundreds of thousands of DJs, no matter what kind of music you’re into, MixCloud has you covered. This is a fresh approach to radio in the 21st Century, where anyone can be the radio host. Simply download the app, search for the radio station that’s for you, and start listening for free. And if you fancy yourself on the other side of the mic, no problem. Just start uploading your own shows! For in-depth analysis on a huge range of topics, you’ll find it hard to beat The Conversation. The site only accepts commentary and editorials from professional academics. What I love about the site though, is that it will often publish several articles on a single subject to offer different perspectives. Reddit is one of the most diverse media sites on the web, with content ranging from the serious to the absurd. It’s also a great source of news, both locally and internationally. By controlling your subreddit subscriptions, you can access a steady stream of feeds of just the stuff you’re interested in. Google News is an aggregator that’s a great way to get an idea of what the coverage of certain topics looks like. It’s also able to use Google’s secret sauce of machine learning to turn up articles you might like based on Google’s statistical models of you. Quartz is home to some of the most intelligent and thought-provoking journalism you can access online. Its global-centric approach offers stories you’re unlikely to find anywhere else. And its understanding of the online world makes Quartz a beautiful site to visit, knowing you’ll always come away more informed than when you arrived. On the surface, Hacker News is a standard tech news aggregator. However, its technologically literate and involved community offers a unique and insightful perspective that’s not available from the more broadly-aimed tech news sites. 538 is the product of statistician Nate Silver, who is known for almost perfectly predicting the outcome of the 2012 political election via some combination of sober statistical modelling and old-fashioned witchcraft. The site provides news blogging from a data-centric perspective, and often offers an interesting and perhaps soberer take compared to traditional twenty-four hour news networks. Al Jazeera is a high-quality international news outlet that provides excellent reporting around the world, and can often give an interesting international perspective on local news. Unfortunately, Al Jazeera America is soon to shut down (at the time of writing), but the site will remain a valuable source for global news. Everybody knows Amazon: it’s the world’s most advanced stuff distribution infrastructure. If you want it, they’ve got it, and can get it to you for a very reasonable price. Amazon is fantastic. For the thrifty, Fat Wallet is a powerful coupon/promotion aggregator that scours to web to help you find the best deals on whatever you’re looking for. Online shopping makes it easier than ever to get a good deal. We've put together a short guide on how to get the best price on just about anything you might be looking for online. If eBay is the world’s garage sale, Etsy is its crafts fair. Thousands of artists and makers turn to the site to create their own online store from which to sell their wares. A bit of searching can bring up some genuinely beautiful, unique items here. It’s a fantastic way to customize your home. eBay has been called the world’s garage sale, and the comparison isn’t unfair. Less of a player than once it was, the site (especially its ‘motors’ section) remains a viable avenue for bargain-hunters all over the world. A first glance at Craigslist, with its early nineties web design and no visible Helvetica, would not cause it to jump out at you as a website relevant to 2016. That’s where you’d be wrong. The minimalist website and its virtual classified ads remain a great way to buy and sell cars, computer equipment, and anything else you can imagine. Just stay out of the personals section unless you’re into that sort of thing. Overstock, Amazon’s iconoclastic little brother, remains a major online retail outlet: they have great deals, good service– and, they accept Bitcoin. What’s not to like? Years after its formation, ThinkGeek remains an internet staple. The stuff they sell is rarely practical, but it is cool: the site delights in nerd tchotchkes and swag, and their stuff makes for great gifts and desk toys for the unrepentant dorks among us. Newegg is a retailer dedicated to inexpensive consumer electronics, and they do a good job of underbidding the big, non-specialized stores. Their refurbished items are often very good deals. For shoppers outside the US, thwarted by region-specific deals and stores, ViaBox lets them permanently register their own US address that they can have parcels shipped to. ViaBox collects the parcels together and ships them anywhere in the world. Canopy is Amazon, curated. Sometimes finding what you’re looking for on Amazon can be damn daunting. So, if you’re particularly keen on beautifully designed products, Canopy might be able to help. The site’s hand-curated products are each stunning, and all available on Amazon. This is a fantastic site to browse and find boutique interior products to help your home to stand out. If you don’t have your own domain and you aren’t using Gmail, what are you doing? Gmail is handily the best email client out there. Integrating seamlessly with all of Google’s other productivity apps, using Gmail is a no-brainer for most people. And with a steady stream of new third-party app integrations, and productivity features being released, it’s only getting better. Google Drive (and its associated suite of web document editors) are handily the best cloud document service out there, especially if you’re already in the ecosystem (via Android or Gmail). Microsoft Office is now offering a free version of many of its popular apps. Among others, these include Excel, Word, Outlook, PowerPoint, and OneDrive. These free versions are naturally less feature-rich than the paid version, but are a fantastic way to access and edit files from within your browser, even if you don’t pay for the full Office suite. IFTTT (If this, then that) is an increasingly powerful automations platform. From a single account, you can start to connect hundreds of services and apps that you rely on. Once connected, you can create “recipes” that automate certain tasks, so you no longer have to do them manually. For example, you could have IFTTT automatically save email attachments to Google Drive. You could automatically publish your Instagram posts as a Tweet. You can even get an SMS alert to remind you when an event is due to start on Google Calendar. Arguably the best to-do list manager out there, Todoist has both a free and paid version. Being able to add, schedule, and search for tasks with natural language is a huge plus. As are the many integrations that the app has with the automation engine IFTTT. With its cross-platform availability, quick syncing, and mass of useful features, Todoist is almost guaranteed to help you get more done. Some to-do list apps stand head and shoulders above the rest. But how do they compare and which one is best for you? We'll help you find out. Evernote is probably the world’s leading, multi-platform note-taking app, that’s also available in your browser. It’s essentially a tool that’s been designed to help you capture anything, at any time. You can save your favorite articles, photos, Pinterest pins, recipes, notes, scanned receipts etc., to your account. Evernote’s powerful search features also make it incredibly easy to find the note you’re looking for, even if like me, you have thousands of them. Microsoft’s free note-taking app is, according to some, even better than Evernote. Its standout feature is the ability to customize the layout of your notes however you want. Each element within a single note can be dragged and dropped to any location. This means you can insert all sorts of media into a single note. Once you start using OneNote, it’s difficult to stop. Before you know it, OneNote can be your one-stop-shop for everything from organizing information, via managing projects, to keeping a daily journal. Here we propose a dozen ways in which you can use OneNote. Google Keep is a simple, much loved note taking app that’s far more lightweight than Evernote and OneNote. You can easily create and store notes, lists, images, and audio in your account. Share these with friends and family, and use Google’s famous search capabilities to find your notes again when you need them. The app is available on your browser, or on iOS and Android.Google Keep has a few features that make it perfect for list keeping. Not only can you create a checklist and sync the app across platforms, Google Keep also offers location-based reminders and more. RescueTime is a browser plugin with an accompanying site that could help you save a huge amount of time. By keeping track of the time you spend on certain sites, you can see an overview of how you’re spending your time online. This insight can help you see where you’re losing too much time, and adjust your browsing habits to become even more productive. Google Plus hasn’t proven to have much staying power as a social network — Hangouts however, is another story. Google’s free, browser-based answer to Skype is a great application and one you’ll find yourself using to keep in touch with friends and family all over the world. Wolfram Alpha is the awesome artificially intelligent graphing calculator that you wish you had in high school. Want to know what a function looks like? Done. Want to see how to solve an equation, step by step? Can do. Want to know the nutrition facts of a cubic parsec of fried chicken? Not a problem. Wolfram Alpha has a bizarrely broad and sophisticated suite of features, and is the student’s best friend. I continue to be amazed by Wolfram Alpha and the way it crunches numbers around openly available data. The result – it shows us the world in a far more inter-connected and interesting way. A great, easy screen-sharing application powered by LogMeIn, Join.me is great for remote collaboration for small businesses and creative ventures. No registration is needed to start an online audio call (with screen sharing), whether from your browser or from Join.me’s extremely simple mobile apps. If you’re trying to get more hours out of your day, outsourcing some of your tasks could be the best decision you’ll ever make. UpWork is the largest freelance jobs site online. Post a job description letting people know the kinds of tasks you’d like them to do (making reservations, data input, etc. ), and you’ll receive a huge number of affordable proposals. Then pick the person you think is right for the job. A few simple habits can help us shed some inefficient ways and increase our reservoir of time doing the things that matter. These ideas can get you one extra productive hour every single day. If, like most of us, you find yourself spending too much time in your inbox, sign up to Unroll.me. This is a free service that detects all the mailing lists you’re subscribed to. You can unsubscribe to as many as you like within a few seconds. And to help clear up your inbox even further, you can have all emails from specific senders compiled into a single email each day. A wonderful platform for short video lectures, TED is a great place for inspiration and education. Ted Talks provide wonderful insight into the projects and ambitions of engineers, scientists, artists, and philosophers. The best TED Talks are the ones that plant seeds in your heart, which later grow into life-altering changes. These videos provide insights into social psychology and give you some food for thought. Blooming from a simple series of math tutorials into the largest school on planet Earth, Khan Academy is a powerful tool for teaching yourself anything from Python to linear algebra. Education has been stuck at a plateau for several years, plagued by several different issues that are seemingly unsolvable -- but technology has finally found ways around these problems. Arguably the web’s best question and answer site, Quora is that place to “share knowledge and better understand the world”. Questions can be submitted and answered by anyone. The site is often frequented by influencers from many industries, with answers to questions being famously high quality. CreativeLive flies the world’s top creatives to their own studios to stream live, in-depth classes on their subject of expertise. If you catch the classes live, they’re entirely free to watch. If you want to watch them after the event, you’ll have to take out your wallet. The quality of these courses are exceptional. And they cover a huge range of creative topics, from photo and video, to art and design, to music and making. Coursera lets you take free online classes from more than eighty universities and educational organizations, all in one place. Lynda is kind of like the Spotify of education. From just $25 per month, you can access the entire catalog of video courses on offer. These are all incredibly easy to follow, covering both the basics and more advanced areas of many technical subjects. These range from 3D animation and CAD, to photography and coding. Hands down the best free tool for learning another language, Duolingo makes it fun, and helps keep you engaged for the long haul. If you’d rather learn something more in the humanities, Open Culture has a massive number of free online courses and educational media for you to choose from. These range from complete lecture series, to free-to-access audio books. Udemy mostly offers paid video courses (40,000 at the time of writing), on every topic imaginable. The courses aren’t particularly cheap, but their price is testament to their quality. Want to be a more efficient person? LifeHacker is a great repository of advice and tricks for living your life better. At the often-surreal intersection of shop class and Pinterest lies Instructables, a massive repository of guides for making everything from mood lamps to robots to chandeliers. If you want to make it, someone will show you how. If you’ve been looking to get into DIY culture, Instructables is a great place to start. Academic Earth was built on the premise of enabling free access to world-class education for everyone. The company is making this possible by allowing free streaming of lectures from many of the top universities on the planet. These include Harvard, MIT, and Stanford. Like Instructables, MAKE is a great introduction to maker/DIY culture, and great source for tutorials. Learning to program? Trying to program? Stuck, or not understanding a concept? Ask StackOverflow! Between the searchable archive (use those first) and an active community of experts, StackOverflow is a fantastic resource for beginning and established programmers. We all know Facebook. It’s the most used social network on Earth and by now it’s hard to get along without it. Facebook is invaluable for organizing events, keeping in touch with old friends, and sharing bad political memes. Twitter seems facile on the surface. However, it turns out that forcing succinctness eliminates a lot of the cruft that pops up on traditional social networks, and the platform has proved a great way to keep up with businesses, friends, and celebrities. Without allowing them to monopolize too much of your time. LinkedIn, a website you may know from those emails it keeps sending you, is a professional social network. Want a job? Need to hire somebody? LinkedIn is your friend. A socially enabled photo app, Instagram is a great way to communicate visually with your friends — or to share oversaturated pictures of your food, if you’re into that sort of thing. Pinterest is a great platform for collecting and sharing eclectic albums of visual content (much of it tutorials, recipes, decor ideas, and art). Previously just a mobile messaging app, WhatsApp also has a web and desktop client. This hugely popular app has become one of the primary ways for over a billion people per month to stay in touch. As an adult, meeting like-minded people outside of work can be tough. Meetup puts an end to this struggle. Acting as a directory of thousands of meetups around the world on a bewildering array of topics, it’s never been easier to make new friends, in real life. Think of Imgur as a slimmed-down Pinterest. Originally developed as a photo-host for Reddit, Imgur has since bloomed into a great image-sharing platform in its own right. Tumblr remains the king of blogging, and is a great place to connect with great original content, or put your own creations out there. While the political side of the site can be scary, the creative side of the platform is phenomenal. For a few years now, Buffer (free and premium), and its accompanying browser extensions, has been making scheduling posts to your social accounts easier than ever. Simply connect your social profiles to your Buffer account, and you can quickly schedule your posts in advance. If you want to get into online dating, this is the biggest, most reputable name in the business. Free, functional, and run by a gaggle of statisticians, OkCupid is a great way to meet people, and is remarkably open-minded about… well, pretty much everything, actually. You know what Google is. It is to search what the pyramids are to wonders of the world (more specifically, nobody remembers the other six). Google will find what you need, quickly and accurately. They’re the best in the business. Want to know where a photo came from? TinEye uses “reverse image search technology” to trawl the web for images similar to the one you submit. This is great for finding other parts of an image series or finding higher-resolution or uncropped version of a low-quality image. Wikipedia is one of the greatest repositories of human knowledge ever constructed. Want to know about anything, from dogs to advanced mathematics? Wikipedia can oblige you.Wikipedia is one of the most famous sites on the Internet. It's informative, as well as controversial, and having a page on there is highly sought after. Let's get to know it better. Got a song stuck in your heads, but can’t remember the words? Midomi lets you search by sound, humming the tune into your microphone and finding music that matches. In terms of online privacy, Tor is the gold standard. Tor makes it very difficult for attackers to figure out who’s talking to who, much less what they’re saying by using computers as a massive obfuscation network to bounce encrypted messages. Tor provides truly anonymous and untraceable browsing and messaging, as well as access to the so called “Deep Web”. Tor can’t plausibly be broken by any organization on the planet. Keeping on top of all your passwords is tough. That’s why so many people use the same password for most of their services. Rather than do this, LastPass remembers all your passwords, and keeps them safe under lock and key. Whenever you visit a site, so long as you’re logged into your LastPass account, you can also log-in to your other accounts, without needing to remember your password. LastPass is also great for You should never share your passwords. But you do, don't you? That's why we're going to show you how to share your passwords while keeping your accounts as secure as possible. This site allows you to find out if any of your account information has been leaked. Just search the site for your email address, and you’ll be shown which of the leaks your data appears in so you can take necessary action to secure those accounts. Think your computer has been infected with a virus or malware? Visit BleepingComputer.com. This is a huge resource not just of security news, but also virus, ransomware, adware and malware removal guides. A free proxy service, allowing you to hide your IP address and location by tunneling through proxies all over the world. Great for getting around region-locked content and censorship, and staying anonymous on the internet. A search engine that scrapes a variety of other search engine to provide its muscle, DuckDuckGo helps to anonymize your searches, making it harder for search engines to build up information about you from your search history. It also keeps no logs of its own users. My Permissions is a handy web-app that collects permissions settings from many major services and lets you manage them from one convenient location. Terms of service are some of the worst text it’s possible to find on the internet. They’re dry, bland, unreadable screeds of legalese not intended for human consumption. TOS;DR takes terms of service and digests them into something succinct and meaningful. Great for people who want to take a more active role in the services they use, and how those services use their data. An easy repository of links for purging various social media accounts from the internet with a minimum of fuss. Offering a similar service to Readability, Instapaper allows you to save articles to read later without any distractions. While reading these on your desktop or via the mobile app, you can highlight passages, make notes, and even integrate your account with other apps using IFTTT. As a final read later app, Pocket is another popular option. With a single click, you can save videos, articles to read on any of your devices (including in your browser). The web is bigger than just English, and Google Translate is a great tool for exploring the parts of it that exist in other languages. Available as a browser extension, Translate leverages Google’s machine learning to convert seamlessly between languages. The results aren’t perfect, but they’re good enough to get by (and getting better with every update). A simple service for hosting samples of formatted text, at unique URLs, to be shared freely on the internet. Lightweight, useful, and clean. Need to sign up for a sketchy service but don’t want to submit your real email to an endless torrent of spam? Mailinator lets you create unique, disposable inboxes which delete themselves after a few days. Want to try a service but don’t want to give them your data or set up an account? BugMeMot lets users create shared profiles for accessing websites and then disposed, without revealing personal information. The best free mapping tool, Google Maps is great for planning trips, and finding your way around. Searching for specific local business, or just the “nearest gas station” is a breeze. A local review site, Yelp lets you check what’s good in your area, and leave reviews if you have a good (or bad) experience. A great resource for finding bargains at restaurants and shops in your area. A local search app, Foursquare lets you find local establishments and attractions that you might otherwise have never discovered. Like Living Social, Groupon offers a selection of local offers. These can often save you a hefty chunk on the original price of a meal, vacation, or tickets to a local show. Even if you’ve been living somewhere for years, finding something to do on your days off can sometimes be a struggle. In these cases, TripAdvisor can serve as more than a hotel and flights directory. It also has an extensive database of local attractions that’ll keep you occupied for some time to come. A foodie’s resource for local restaurant reviews, Zomato is great for discovering hidden gems in your neighborhood — and finding out which expensive restaurants aren’t worth your time. One of the best weather sites out there, Weather Underground is a great resource, especially if you’re the outdoorsy type and need to know whether or not you’re going to freeze your jorts off. Own an e-reader but hate paying for e-books? Luckily, a huge number of great classic books are no longer under copyright. Project Gutenberg is a massive repository for these texts, in a dazzling array of formats, all available free of charge. There's a treasure trove of free, out-of-copyright books available on Amazon.com to download to your Kindle right now. Here are our recommendations for classic novels you should be reading. A large social network for book enthusiasts! Great for keeping track of the books you’ve read, connecting with other readers, finding quality book reviews, and sharing recommendations. The internet’s home of audio books, Audible has an insanely-sized catalog featuring most classics, many new releases, and a host of quality audio courses to keep you learning for years. These are perfect for listening to in the car, at the gym, or simply as a way of reading a book while giving your eyes time to rest from the screen. The Great Courses are reason enough to go to Audible. We pick the best series of lectures in science, the arts and humanities by some of the most respected scholars in their fields. If you’re anything like me, your list of books to read is literally never ending. However, the insights of some books can be garnered in a few short minutes. And that’s what Blinkist is about. The ideas of over 2000 bestselling non-fiction books have been condensed so you can read or listen to them in just 15 minutes. You can be a book lover without being pretentious. And that’s exactly what Book Riot is selling. An online publication filled with witty, entertaining news and reviews of all things book-related, this is a literary blog anyone can love. Invaluable for Kindle owners, Pixel of Ink tracks down great Kindle ebooks available cheaply or for free. Great for the bargain-hunting reader looking to expand their horizons. A sort of Pandora for books, this site is a book recommendation engine that takes books you’ve enjoyed and recommends new books based on them. This is a website that keeps track of the bestselling free Amazon kindle books. While there is a lot of fairly thin genre fiction, there are also some genuine gems. Another book recommendation engine which works by taking in information about what you’re looking for, and matching you to hand-classified books in its library. An entirely automatic spending tracker and budgeting tool, Mint is great for people trying to build financial responsibility who have trouble keeping track of the specifics of their finances. When it comes to sending and receiving money online, PayPal is a major player. A huge (and growing) number of online retailers and service providers now accept payments via PayPal. And you can even send international transfers for a tiny fee. TransferWise is a quick and easy way to send money abroad. Their fees are usually far lower than your bank would charge (including PayPal). Send your money to your TransferWise account. They convert it into the currency of your choosing (if it’s available), and it’s then sent to the recipient. Money Saving Expert is an absolutely huge resource covering everything you could possible need to save money. Whether you’re trying to find coupons, or looking for credit card deals you’ll find the advice you need. The site also has an incredibly active forum if you have more specific questions to ask. Rather than relying on just one financial news site, Google brings together stories from the many of the best. Whether that’s Reuters, Bloomberg, or the Financial Times, the main headlines will show up in Google Finance. You’ll also have easy access to all the market and portfolio data you need. Need to track your spending to find out where your money is going? Expensify lets you track your spending in many ways and generates expense reports and analyses for you to look over later. Great, easy to use software for filing your taxes at the end of the fiscal year. Free for federal taxes. MakeUseOf maintains a list of the best free software for Windows, OSX, Linux, Android, and iOS, and more. If an app you previously used has started charging, or isn’t quite offering what you need, check out AlternativeTo. Type in which application or website you want to replace, and the site will churn out plenty of decent alternatives for you to try. GitHub, currently the most popular platform for hosting and contributing to open software projects, is fantastic. It gives access to downloads, version history, commit logs, and contributor statistics. Similar to GitHub, SourceForge is another open-source coding repository to help you “find, create and publish open source software for free”. A successor service to the popular (and now defunct) Megaupload, Mega is currently one of the best file hosts on the internet, with local file encryption, fast downloads, and 50 GB of free storage space. Dropbox is a great solution for sharing the contents of folders between computers. As the first service that did it well, Dropbox remains the main alternative to emailing files to yourself. Microsoft’s answer to Google Drive, OneDrive lets you host, share, and edit Word, PowerPoint, and Excel documents from your browser, across multiple machines. If you’re in Microsoft’s online ecosystem, it’s a great resource. A virtual hard drive for hosting your files, you can access them from any internet-enabled machine, and edit them from your browser. When you do get stuck emailing documents to your team, HighTail is a great way to get around arbitrary file size caps on email clients, allowing you to email documents and folders up to two gigs in size. The platform also allows feedback to be left on each document uploaded for easier collaboration. A great general file converter, allowing the conversion between many different image, audio, document, and video formats. Great for any application that supports only specific file types. A barebones, social-network-integrated file-sharing app, Ge.tt lets you easily upload files and share them across a variety of platforms.